iCal is the the first app that gets fired from my dock everyday in the morning. It is my preferred event manager that helps me organize my work schedule, keep track of household chores and even set birthday reminders. It helps me get through the day with ease, making it indispensable and any app that improves upon the whole iCal experience is more than welcome. Enter Fantastical. The beautiful Fantastical app ships from the Flexibits factory. It does an amazing job at simplifying the whole iCal experience. Also not only does Fantastical work on iCal, it also supports Outlook and BusyCal. iCal, Outlook or BusyCal are all complete applications in themselves and Fantastical does not add any new features to them. But before you give up on Fantastical, read on to find out how it changes the whole iCal experience. I’ll continue to use iCal throughout the review but remember, all the things apply to Outlook and BusyCal users as well. Fantastical resides in the menu bar and a click on the icon reveals the shiny rectangular drop down interface that houses the calendar and allows to add and view events. When using the app for the first time, you’ll notice elements and animations that have been meticulously added by the developers at Flexibits. Be it the words flying out from the text box, pencil-made circles on the dates, brushed paint highlighting the event date or the calendar clinging to the two staple pins, each and every detail has been done brilliantly. 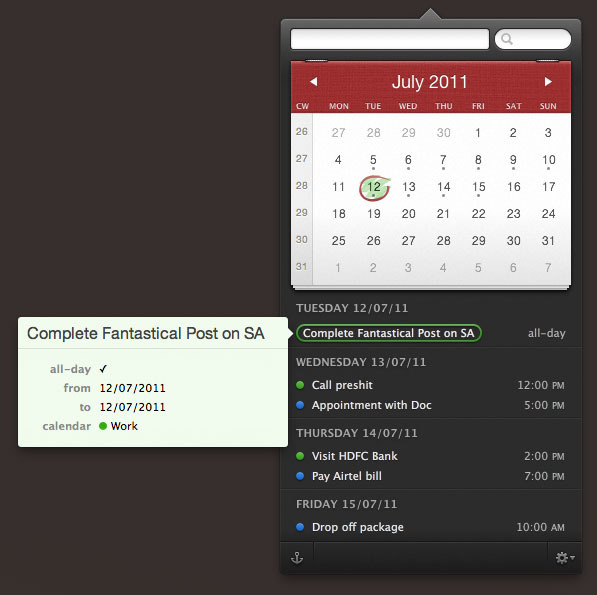 The neat and compact interface lays the groundwork for an easy switch from iCal to Fantastical. Fantastical picks up events already added to iCal and any new events created in Fantastical are added to iCal automatically. Adding new events is easy like a pie. Start typing in the text box to create an event or create one by double tapping a particular date. The app has plain English support, so I can type “Call Preshit tomorrow at noon” and a new event gets created with the specified date and time. Dates are also recognized in plain english, paving the way for super fast event creation. When you begin to type, the calendar slides down, revealing options to add event location, duration, select a calendar or even add invitees to the event. Simply put, the app looks great and works great but the inability to edit/delete an event or create a To-Do is sorely missed in the app. Fantastical comes with quite a few preferences to tweak around. Apart from the menu, the app can be accessed by a custom keyboard shortcut. The menu bar icon can be customized to show only the date or date along with weekday or month. Default calendar and alarm settings for timed events and all-day events can be set within the preferences. So if you usually like to be alerted, say, 15 minutes before an event, let Fantastical in on this fact and it will appear as your default alarm setting for new events. I like the option to manually set the number of days to view the event list for. This means you can have Fantastical show the events just for today or for the next 31 days. Events from your super secret individual calendars can be hidden in the preferences too. If you’ve reached this far reading the review, pull out your credit card because I’m sure you’ll wanna buy Fantastical. By concocting just the right ingredients, Flexibits developers have come up with the perfect recipe to manage your calendar. The ubiquitous nature of the app coupled with beautiful and super easy to use interface, makes it worth the $19.99 it retails for on the Mac App Store. There is also a 15-day trial version available if you still can’t make up your mind. iCal power user like me would surely want to splurge on this handy little app that makes your life just a little bit easier to manage.